Earth is too large to lose a significant proportion of its atmosphere through Jeans escape. The current rate of loss is about three kilograms (3 kg) of hydrogen and 50 grams (50 g) of helium per second. The exosphere is the high-altitude region where atmospheric density is sparse and Jeans escape occurs. Earth's atmosphere is leaking. Every day, around 90 tons of material escapes from our planet's upper atmosphere and streams out into space. Although missions such as ESA's Cluster fleet have long been investigating this leakage, there are still many open questions. How and why is Earth losing its atmosphere – and how is this relevant in our hunt for life elsewhere in the Universe? are in no danger of running out any time soon. 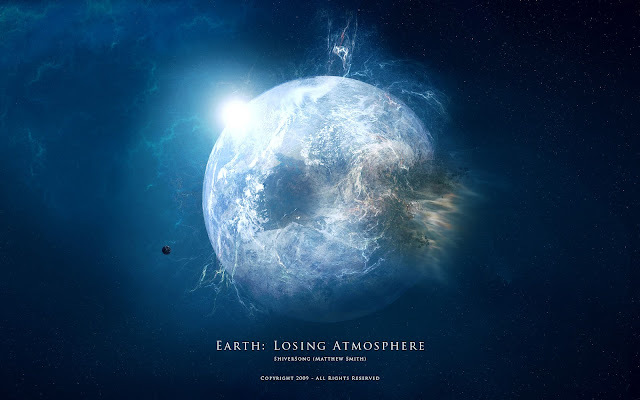 However, understanding Earth's atmosphere, and how it escapes to space, is key to understanding the atmospheres of other planets, and could be crucial in our hunt for habitable planets and extraterrestrial life. We have been exploring Earth's magnetic environment for years using satellites such as ESA's Cluster mission, a fleet of four spacecraft launched in 2000. Cluster has been continuously observing the magnetic interactions between the Sun and Earth for over a decade and half; this longevity, combined with its multi-spacecraft capabilities and unique orbit, have made it a key player in understanding both Earth's leaking atmosphere and how our planet interacts with the surrounding Solar System. 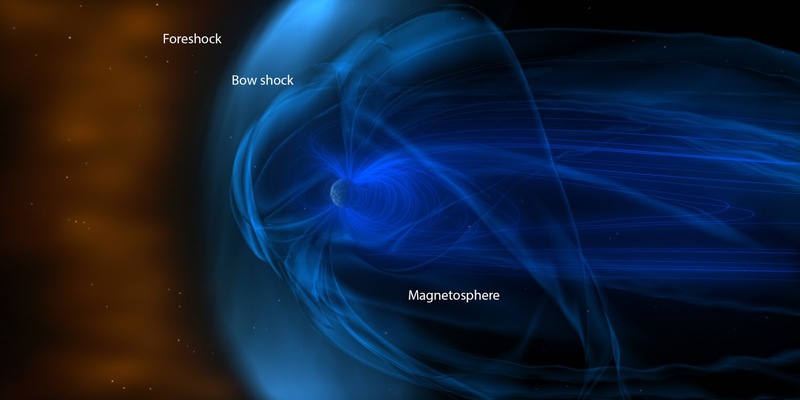 Earth's magnetic field is complex; it extends from the interior of our planet out into space, exerting its influence over a region of space dubbed the magnetosphere. At its outer Sunward edge, the magnetosphere meets the solar wind, a continuous stream of charged particles – mostly protons and electrons – flowing from the Sun. Here, our magnetic field acts like a shield, deflecting and rerouting the incoming wind as a rock would obstruct a stream of water. This analogy can be continued for the side of Earth further from the Sun – particles within the solar wind are sculpted around our planet and slowly come back together, forming an elongated tube (named the magnetotail), which contains trapped sheets of plasma and interacting field lines. However, our magnetosphere shield does have its weaknesses; at Earth's poles the field lines are open, like those of a standard bar magnet (these locations are named the polar cusps). Here, solar wind particles can head inwards towards Earth, filling up the magnetosphere with energetic particles. One of the key escape processes is thought to be centrifugal acceleration, which speeds up ions at Earth's poles as they cross the shape-shifting magnetic field lines there. These ions are shunted onto different drift trajectories, gain energy, and end up heading away from Earth into the magnetotail, where they interact with plasma and return to Earth at far higher speeds than they departed with – a kind of boomerang effect. Cold ions may play a significant role in deciding the direction of the ejected plasmoid. These recent simulations showed a link between plasmoids heading towards Earth and heavy oxygen ions leaking out from the ionosphere – in other words, oxygen ions may reduce and quench the reconnection rates at certain points within the magnetotail that produce tailward trajectories, thus making it more favorable at other sites that instead send them Earthwards. These results agree with existing Cluster observations. 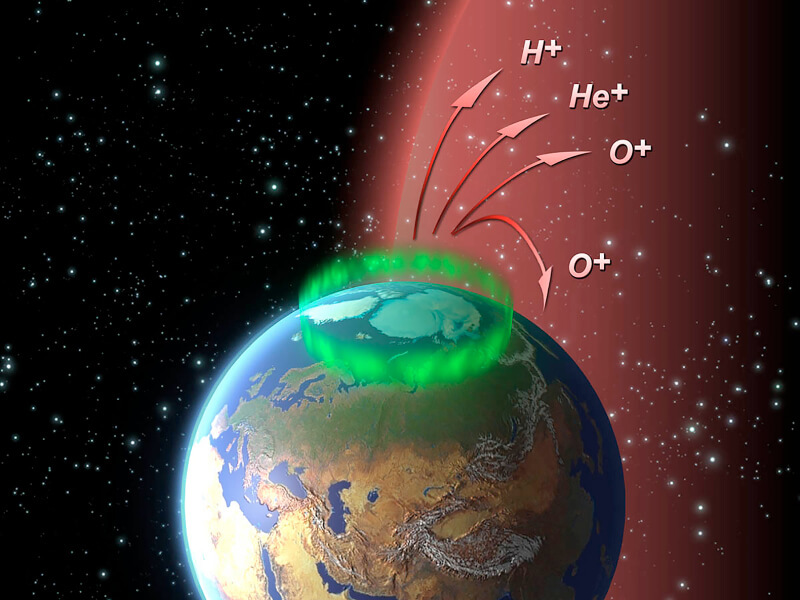 Another recent Cluster study compared the two main atmospheric escape mechanisms Earth experiences – sporadic plumes emanating through the plasmasphere, and the steady leakage of Earth's atmosphere from the ionosphere – to see how they might contribute to the population of cold ions residing at the dayside magnetopause (the magnetosphere-solar wind boundary nearest the Sun). Both escape processes appear to depend in different ways on the interplanetary magnetic field (IMF), the solar magnetic field that is carried out into the Solar System by the solar wind. This field moves through space in a spiralling pattern due to the rotation of the Sun, like water released from a lawn sprinkler. Depending on how the IMF is aligned, it can effectively cancel out part of Earth's magnetic field at the magnetopause, linking up and merging with our field and allowing the solar wind to stream in. Earth’s core, that field would not exist. Plumes seem to occur when the IMF is oriented southward (anti-parallel to Earth's magnetic field, thus acting as mentioned above). Conversely, leaking outflows from the ionosphere occur during northward-oriented IMF. Both processes occur more strongly when the solar wind is either denser or travelling faster (thus exerting a higher dynamic pressure). "While there is still much to learn, we've been able to make great progress here," said Masson. "These recent studies have managed to successfully link together multiple phenomena – namely the ionospheric leak, plumes from the plasmasphere, and magnetic reconnection – to paint a better picture of Earth's magnetic environment. This research required several years of ongoing observation, something we could only get with Cluster." Consider the diversity seen in the planets and moons of our Solar System, for example. In our small patch of the Universe we see extreme and opposite worlds: the smog-like carbon dioxide atmosphere of Venus, the much-depleted tenuous atmosphere of present-day Mars, the nitrogen-rich atmosphere of Saturn's moon Titan, the essentially airless Jovian moon Callisto, the oxygen-bearing atmosphere of Earth. "Understanding more about our own atmosphere will help us when it comes to other planets throughout the Universe," said Escoubet. "We need to know more. Why does Earth have an atmosphere that can support life, while other planets do not?" Cluster is a unique mission; it comprises four spacecraft – a format that NASA recently used for their Magnetospheric Multiscale (MMS) mission, launched in 2015 – which allow continuous study of Earth's magnetic field and the solar wind from multiple locations and orientations. Cluster has been operating since 2000, and in that time has compiled a wealth of information about our magnetic environment across various periods of solar and terrestrial activity. "Additionally, Cluster's orbit is truly unique amongst all current missions; the fleet is on a polar orbit, meaning they can explore our planet's dynamic polar regions – specifically the cusps and polar caps – up close and in unprecedented detail," added Escoubet. "Overall, long-term space missions like Cluster are helping us to understand a whole lot more about our planet, its atmosphere, and atmospheric loss in general – which in turn will help us to understand the Solar System in which we live." Cluster's payload consists of state-of-the-art plasma instrumentation to measure electric and magnetic fields over wide frequency ranges, and key physical parameters characterizing electrons and ions from energies of near 0 eV to a few MeV. The science operations are coordinated by the Joint Science Operations Centre (JSOC) at the Rutherford Appleton Laboratory, United Kingdom, and implemented by ESA's European Space Operations Centre (ESOC), in Darmstadt, Germany.